House Speaker Paul Ryan told GOP members Monday he will no longer defend Donald Trump and is instead focusing on keeping the House in Republican hands. The Republican National Committee is sticking with embattled GOP nominee Donald Trump even as House Speaker Paul Ryan said Monday he would no longer defend his party's presidential nominee. Ryan told Republican members on a conference call this morning that he will instead focus on protecting the GOP's congressional majority in the final month of the campaign, according to someone on the call. The move comes after a wild weekend in the race for the White House that saw many lawmakers rescind their endorsements of Trump and call for him to leave the race after a 2005 video surfaced of Trump making lewd comments about women and bragging about groping and kissing them without consent. The speaker told his members "you all need to do what's best for you in your district" and that he will not defend Trump or campaign with him over the next 29 days until Election Day on Nov. 8. Ryan had been planning to campaign with Trump on Saturday, the day after the video surfaced, but that appearance was quickly scrapped. Trump responded on Twitter a short time later, chiding Ryan to "not waste his time on fighting Republican nominee." Republican National Committee Chairman Reince Priebus struck a different tone from Paul later Monday evening, reiterating in a call with RNC members that they would stand fully behind Trump, according to a source on the call, and that reports over the weekend that they were abandoning the GOP and redirecting resources from their joint Victory Fund were false. "I want to make it very clear that the RNC is in full coordination with the Trump campaign and we have a great relationship with them," Preibus said, according to the Wall Street Journal. "Nothing has changed with regard to our relationship." Preibus also made clear on the call it was the RNC's goal to keep their congressional majorities, and that they were working with the House and Senate campaign committees to ensure that. But for Paul though, it was clear protecting the House was paramount to further boosting Trump. According to sources, Ryan will now spend his energy to make sure that Democratic nominee Hillary Clinton doesn't get a blank check with a Democratic-controlled Congress if she does win the presidency. That includes campaign stops in 17 states and 42 cities to help protect the GOP majorities in the House and Senate, with more planned. This is what Ryan sees as best for the party and for his members, not himself, and he was aware there may be other political pressures to get him to do otherwise, but his concerns about keeping the majority superseded that. "The speaker is going to spend the next month focused entirely on protecting our congressional majorities," Ryan spokeswoman AshLee Strong said. 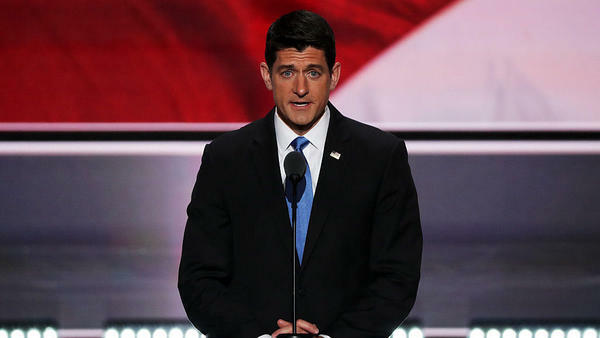 As to speculation that Ryan could rescind his endorsement of Trump, Strong said "there is no update in his position at this time." Republicans have a 30-seat majority in the House, and it's one that wasn't considered very fragile until the events of the past 72 hours. While so many Democratic pick-ups remain a long shot, if Republicans stay home from the polls, frustrated with their two choices, more seats than expected could be lost. In the Senate, however, Democrats only need to flip five seats (or four with a Clinton victory) to take back control. But while many of the more than 30 Republicans who called for Trump to drop out came from competitive districts, not all lawmakers were ready to dump Trump en masse. Another source on the call said many lawmakers were "really fired up" and wanted to stick with the GOP nominee. The vast majority of House Republicans represent safe GOP districts and therefore have little political incentive to distance themselves from Trump. California Rep. Dana Rohrabacher, who represents a safe Republican district, told leadership he was disappointed in them. But other more moderate members, such as Pennsylvania Rep. Charlie Dent, said he thought Trump should step aside and predicted that more damaging information could still come out in the next 29 days. House Majority Whip Kevin McCarthy, R-Calif., urged lawmakers to stick together, according to another source on the call. And National Republican Congressional Committee Chairman Greg Walden, R-Ore., said that the ground had shifted following the weekend's events and to keep looking at their polling numbers over the past few weeks. Republican leadership recognizes that for the larger GOP as a whole — and members in competitive districts — the signs aren't good. Just as Ryan was informing members of his decision, an NBC News/Wall Street Journal poll came out showing Clinton with an 11-point lead over Trump, 46-35 percent. That same survey gave Democrats a seven-point edge in the congressional generic ballot, 49-42 percent — numbers that haven't been seen since the government shutdown in September 2013. That poll was conducted after the release of the lewd video, but before Sunday's debate where Trump tried to stop some of the bleeding. But the bitter debate likely did little to change voters' feelings about the GOP nominee in whole. He showed little contrition for his actions 11 years ago, explaining the comments away as "locker room talk." And Trump trotted out women who had accused former Bill Clinton of sexual assault and claimed the former president had done "far worse" to women — a strategy which GOP focus groups have shown backfires. Wisconsin still isn’t sure how the presidential race will play out here. But the candidates or their surrogates continue coming to campaign. A couple rallies over the weekend didn’t turn out exactly as planned. 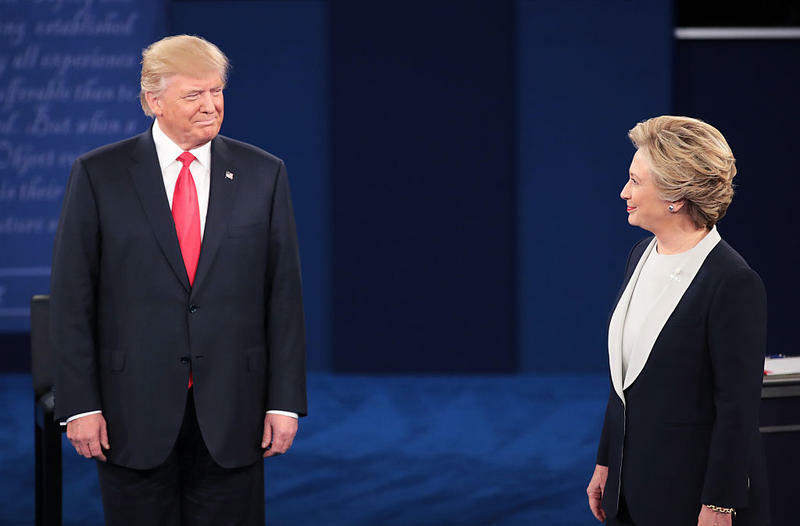 Republican Donald Trump and Democrat Hillary Clinton faced off in the second presidential debate Sunday night at Washington University in St. Louis, Missouri. Held in a town hall style, about half the questions came from uncommitted voters selected by the Gallup Organization and the other half were asked by the moderators, CNN's Anderson Cooper and ABC's Martha Raddatz. 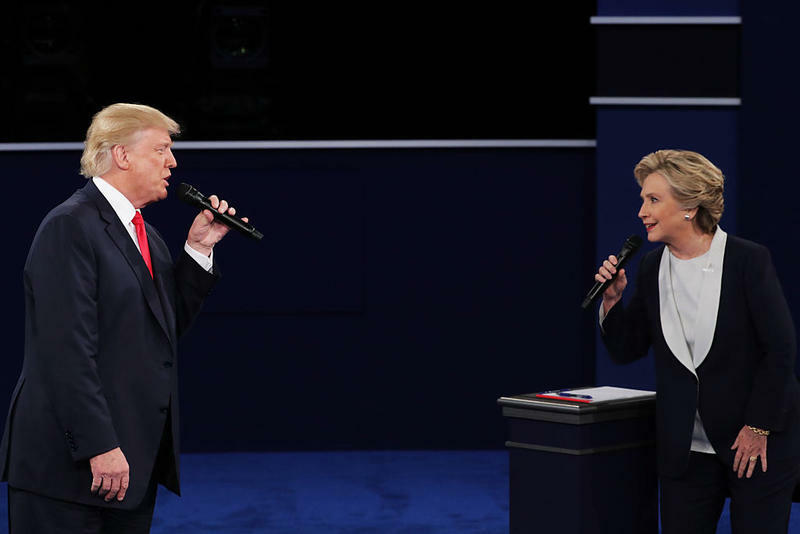 NPR's politics team, with help from reporters and editors who cover national security, immigration, business, foreign policy and more, live annotated the debate.